I Want to Sign Your Book for the Holidays! Can you believe it’s October already? I’m dismayed enough that there are already pumpkins outside the grocery store, but my 8-year-old informs me that there are just twelve Thursdays left until Christmas. And, after quickly consulting the calendar, I can confirm she’s correct. That got me thinking: 2018 has been a heckuva magical year for me, so I wanted to come up with some way to say thank you to all of you. One of our favorite kinds of holiday gifts at the Reid house is books signed by the author. 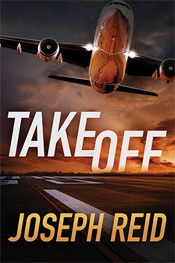 And one of the best parts of TAKEOFF debuting this year has been the chance to sign books for readers, whether it was at bookstores like Mysterious Galaxy and Mystery Ink, or at conferences like ThrillerFest and Bouchercon. So, I thought, wouldn’t it be great if I could combine the two? If you’re in San Diego, feel free to stop into Mysterious Galaxy. If you purchase a copy of TAKEOFF there, I’ll happily personalize it for you however you’d like. Let the clerks at the MG counter know, leave the book with them, and then email me a picture of the receipt here at the site, along with instructions for how you’d like the book personalized. I’ll stop into the store and do the signature in person. If you live outside San Diego, or can’t make it into the store, never fear! I’ve also purchased a number of archival quality, acid-free bookplates that I can sign or personalize. 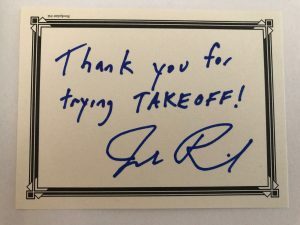 For those, the offer is basically the same: send me an email here at the site with a picture or screenshot of your receipt from purchasing TAKEOFF, instructions on how you’d like each plate personalized, and your snail mail address, and I’ll send you a bookplate for each copy you bought. Now, there’s obviously a few wrinkles that we’ll need to keep in mind. The plates measure 3″ by 4″, so I won’t be able to write a separate novel on each one, but I’ll do my best to get whatever you want on there. To make sure I can get to MG or get you the plate on time, please leave me enough time to get there or for the mail to be delivered. I’m really looking forward to this! For everyone who loved TAKEOFF, I hope I can make your copy of the book special and say thank you for giving it a try. And for anyone who has a book lover in their life, I hope a signed copy TAKEOFF will make a perfect gift and reduce all the last-minute stress of gift shopping in December. Thanks again! And Happy Holidays (in advance)!